Lis used fresh calamari, cleaning them is tedious but after you see her beautiful burgundy sauce, it worth! I just couldn't wait and grab the frozen one... I've told Lis it's not easy to get fresh calamari around here. Fish mongers in most supermarkets treat seafood like diamond placing inside a counter. But I need to touch, press, pinch and even smell that squids! Gross? If I got the stinky rotten to home that is real gross ;p Anyway, my recipe in the below is only a short-cut, Lis' sauce I believe is the ultimate! Heat a medium-large pot, add some olive oil, saute onion for a minute, add garlic and fry for 30 seconds. Add the diced tomatoes, the tomato puree, and 5 oz of tomato paste (and carrot) in the same pot, bring to boil. Add squid and clam. When the liquid boils again, lower the flame to simmer, put the lid on but leave it slightly open. Since the frozen squids have not much taste, that's why I included clam. However, clam turned very rubbery after prolonged cooking. I may try to put them in the very end next time. My frozen squid's imported from Indonesia, it looks stubby, not sure if they actually relate to cuttlefish. Any idea on that my friends? This looks amazing! To be honest, I am not a huge fan on seafood with tomato-based sauces, but I may need to try this! Regarding the clams - perhaps use clam juice for the sauce to get the flavour, then add the clams at the end? It's really good to read recipes with the cook's notes, it gives us more chances to succeed in preparing it! For a first try you have outdone yourself! I could just dip my fork right into that pasta and twirl! 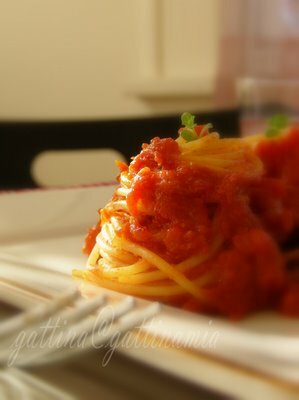 I love the way the pasta is twirled so beautifully in the photo!! And I'm with you--we should be able to peek into the seafood's eyes and sniff and touch it!!! Talk to it even! I l crave a dish like this and have made it with shrimp. But, I think squid and clams are a marvelous idea! As am a complete vegeterian , I loved all the vegeterain recipes of yours here . will keep coming here for more. Your photos are absolutely amazing! Just beautiful! This dish is very italina style, brava! Delicious recipe gattina. I always love the food combo you choose! Can't tell which make me more hungry your words or the pictures! I need a fork! 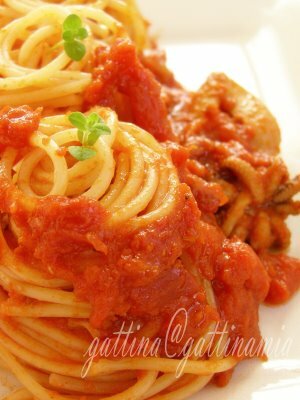 Hi Gattina,I am back.That sauce on top of the noodles is making me drool.Wonderful color and texture.Graet photo. Ellie, same sentiment! But I do like sardine in tomato sauce though. Thanks for your advice (clam juice), it's a lovely idea! Angie, that mould quite large, I think you got to change *gulp gulp* hehee. Pat... oh what happened? Did my switch to new Blogger affecting your sign-in name? Me too, like to see someone writing a reviewing or putting notes. Mmm... another anonymous (my friend, blame to new Blogger! ), thanks for your compliement. Hope your name will show without any problem next time. Lis... one more anonymous... hug to you too! Without your inspiration I would have had such a good chance in trying all these wonderful ingredients! Yes, absolutely, I'll go for the fresh squid next round! Anh, I love anchovy! It's one of my favorite ingredients in pasta! Thanks for the tip! Sher, *high five* squid, if you can strangle me, please do so! Pooja, you have a lovely blog! I can go on total veg many days (no particular reason, just follow my body's needs), occasionally I feel like eating meat. Kristen, thanks for your compliment! Francesca, I agree too. Baci! Bea, oh thanks! Come to seafood, I am happy with any combo! I love seafood and now that I have 2 glowing endorsements for this sauce it has been added to my ridiculously large pile of "make this immediately" recipes.